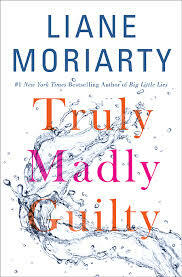 A traumatic experience takes center stage in the new novel from Australian author Liane Moriarty in Truly Madly Guilty, but we don't find out what actually happened until far into the book. Instead, events jump between the present, where we see the effects of whatever-it-was sending ripples out through the lives of various characters, and the past, where we see how the "Day of the Barbecue" unfolded. Clementine and Erika have been friends since childhood. Erika came from a single-parent home where her mother was a hoarder. As a result, Erika was neglected, withdrawn and isolated. Clementine's mother, a social worker always on the lookout for someone to rescue, demands that Clementine befriend Erika. She reluctantly does so, and has continued to do so ever since, even though she does not particularly like Erika and feels burdened and frustrated at always having to look after her. Clementine is married, has two young daughters, and is a professional cellist who always has to audition for jobs and has a big one coming up. Erika is also married, but childless and has a high-paying and respectable job as an accountant. Erika and her husband Oliver have invited Clementine's family over for dinner. As Erika leaves her house on the way to the store, her neighbor Vid stops to chat. Vid is a very successful and slightly shady businessman who lives in a huge, ostentatious mansion with his new trophy wife Tiffany and their daughter Dakota. When Vid hears Erika is inviting people over for dinner, he insists that everyone come over to his house for a barbecue instead. He loves socializing and cooking, and his dominant personality means that Erika soon gives in without consulting any of the others. Clearly, from the way the book is structured, something catastrophic happens at the barbecue. Based on the fact that the book opens with Clementine, several months after the barbecue, is giving "yet another" speech to a community group about her experiences, you get the impression that whatever the terrible event was, her children were involved. While it is very suspenseful to try to work out what in the world happened at the barbecue from the sparse clues we're given, the rest of the story is very tedious. It's over and over about how Clementine is worried about the upcoming audition, how Erika is such a pain in her life, how poor Erika is so emotionally stunted and has such a terrible life (although she's happily married and has no financial worries), etc. The book just seems on a boring, never-ending loop going over and over the same ground without the story really advancing. I'm sure it's an attempt to draw out the narrative and heighten the suspense before "the big reveal" but it makes for very dull reading. I read some of Liane Moriarty's earlier books and really liked them, but sadly, this one is mostly filler and very little of substance.